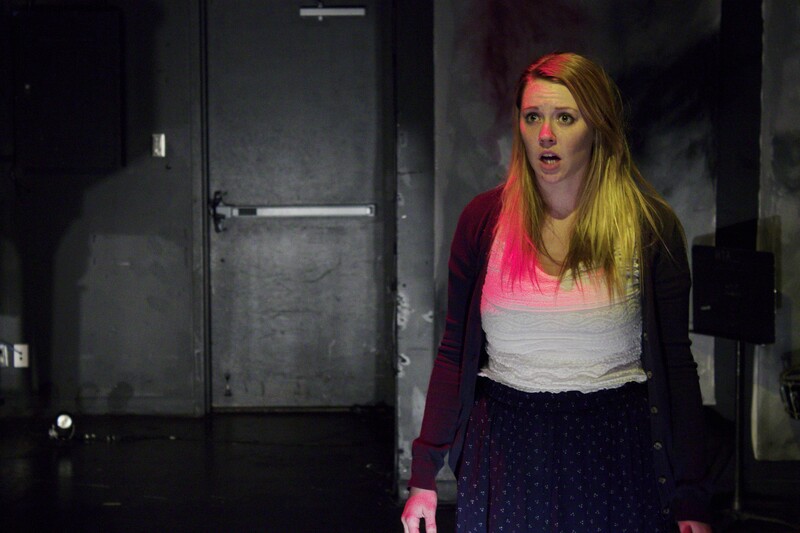 Kas Nixon as Alison in Ryan Reese’s Before The Night Takes Us. Photo Credit: Colton Holmes. Alison (Kas Nixon) hasn’t been sleeping well lately. Nightmares of grisly murders torment the frustrated clarinetist who has all but lost her ability to play. When Ray (Joel David Taylor), a telepathic pianist, walks into Alison’s life, she is soon thrown into something more sinister than she could ever expect. For Alison, things are only going to get worse (and weirder) before they get better. Presented by Theatre BSMT, Ryan Reese’s Before The Night Takes Us is a suspense-filled drama that trips over its paranormal premise. For a character whose abilities are even a mystery to him, Ray sure seems to have a lot of answers, or a lot of good guesses. Part of that is due to Reese being quick to change/expand the rules of Ray and Alison’s telepathy when convenient. Of course, Reese is faced with the challenge of both establishing ground rules to adhere by and fleshing out a whole story within 120min, so wild assumptions by the characters are to be expected. Still, one cannot help but feel that the drama is undermined by fluctuations in the play’s logic. Thankfully, Amy (Samantha Duff), a no-nonsense detective, gives the play immediacy, a sense of danger. While Amy trusts Ray’s abilities, Amy also needs answers now. She can’t wait on Ray to unlock the secrets of Alison’s dreams, especially not when there is a serial killer loose in the city. For Amy, the clock is ticking, and every minute that goes by is another minute where someone’s life is in danger. But again, there are some problems with the play’s logic that are hard to ignore. The truth about Alison’s dreams raise questions about what kind of office Amy is working in that none of her colleagues or superiors would notice something off about one of their top detectives. And despite having access to her case files, in addition to her mind, Ray fails to recognize any inconsistencies with the investigation. These issues aside, Reese intrigues with the general greyness of the characters – greyness in terms of his characters’ true motives, their murky pasts, and their relationships with one another. As we become more acquainted with Alison, Ray, and Amy, the loneliness of these characters become more apparent; the search for a connection more potent. And that is mainly what carries our interest through to the end: the fate of these characters thrown together against strange circumstances. Unfortunately, the play proceeds at a choppy pace, mainly due to its scenes of varying lengths and their hard transitions. When the lights come down, so too does the energy. The dip in pace is partly due to the odd configuration of just one entrance/exit. Director Kyle Schulte might have opted for a set-up that allows better flow between scenes, rather than one where there is a good amount of unused physical space (which would feel emptier if it were not for some instruments laying around). Taylor rises to the task of playing the piano live on stage. He and Nixon share good energy together on stage. Though Duff is who most catches our eye with her menacing presence. Fortunately, Nixon holds her own in her clashes with Duff. The two are a sharp pair that respond to each other effectively. A murdery mystery with a paranormal twist, Reese’s Before The Night Takes Us catches our attention with its grey characters, but then loses us with its thin logic. Theatre BSMT’s Before The Night Takes Us runs May 6 – 9 at Motel Theatre (Arts Commons).